1954 | 50 Westerns From The 50s. Nancy Gates has passed away at 93. She was from Dallas, signed with RKO at just 15, and made some really good movies before retiring in 1969 to concentrate on her family. 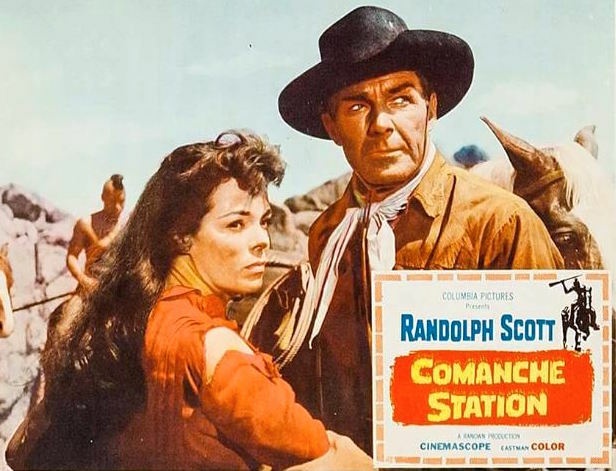 She was particularly strong in Westerns such as Masterson Of Kansas (1954), Stranger On Horseback (1955), The Brass Legend (1956), The Rawhide Trail (1958), The Gunfight At Dodge City (1959) and Comanche Station (1960). Her other pictures include Hitler’s Children (1943), At Sword’s Point (1952), Suddenly (1954), World Without End (1956) and Some Came Running (1958). She was busy on TV, too, with everything from Maverick and Wagon Train to Alfred Hitchcock Presents and Perry Mason. Around here, we’ll probably always remember her as Mrs. Lowe in Comanche Station. She’s really terrific in that one. 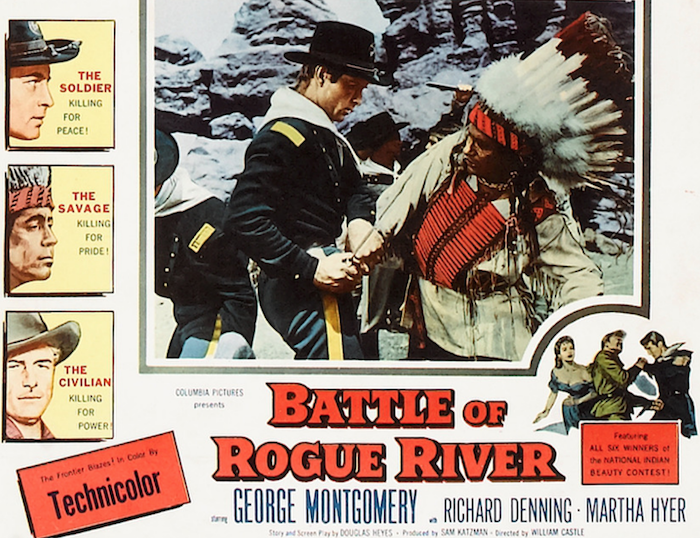 Blu-Ray News #274: Sitting Bull (1954). 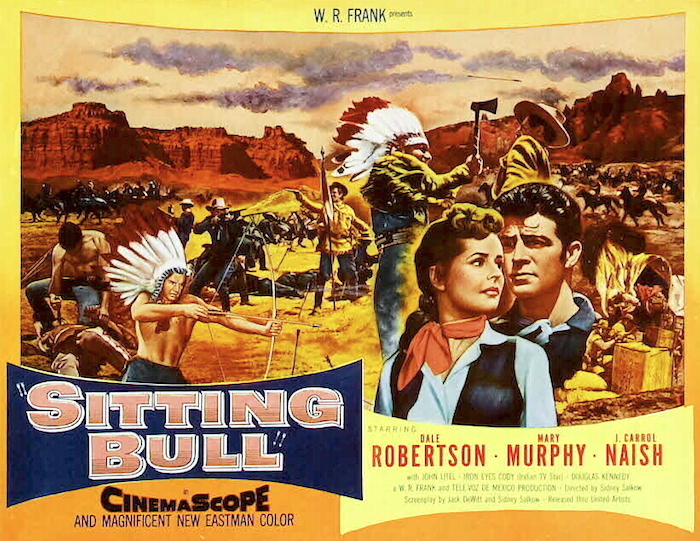 Shot in Mexico to save money, Sitting Bull (1954) was the first independent production shot in CinemaScope. As history, it’s hogwash, but as a cowboy movie, it’s pretty good — especially with that cast and with a sympathetic look at the Indians. Thanks to John Knight for the news. Just heard the sad news that Julie Adams has passed away at 92. One of my favorites actresses, she made some great Westerns for Universal-International in the 50s — and she was always so beautiful in Technicolor. She was born Betty May Adams in 1926 in Waterloo, Iowa. In 1946, at 19, she was crowned “Miss Little Rock.” From there, it was off to Hollywood. Betty May worked as a secretary and appeared in a few B Westerns. 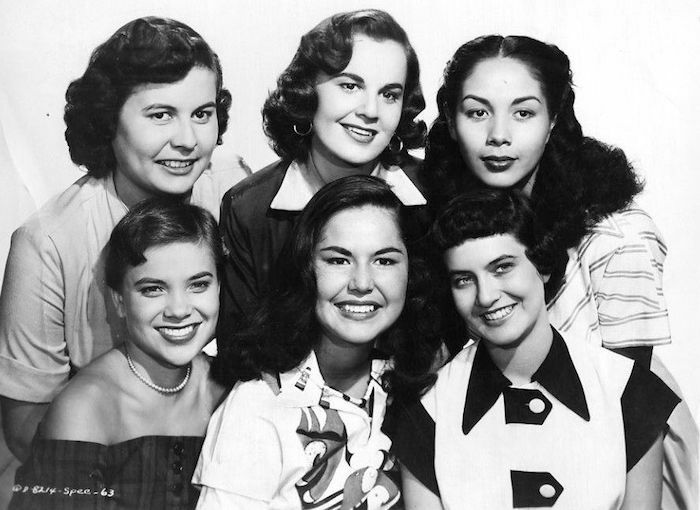 She used her real name until 1949, when she signed with Universal-International. She then became “Julia” — and eventually “Julie”. Universal kept her plenty busy. 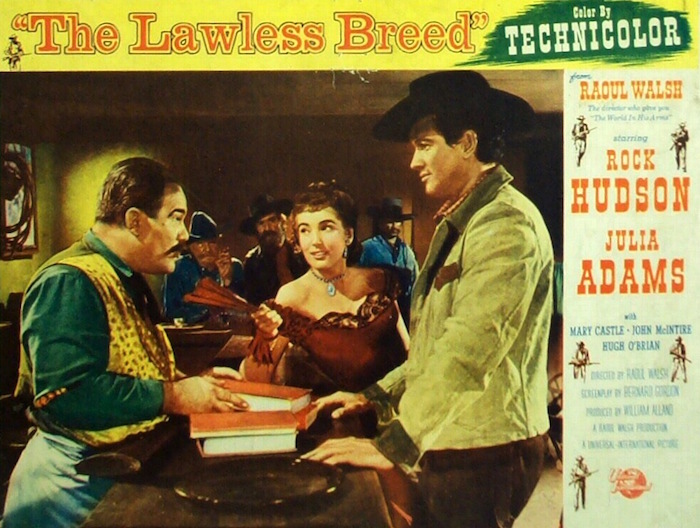 She appeared opposite James Stewart in Anthony Mann’s Bend Of The River (1952), Van Heflin in Budd Boetticher’s Wings Of The Hawk (1953, up top) Tyrone Power in The Mississippi Gambler (1953), Rock Hudson in Raoul Walsh’s The Lawless Breed (1953, above), Glenn Ford in The Man from the Alamo (1953) and Rory Calhoun in The Looters (1955), to name just a few. 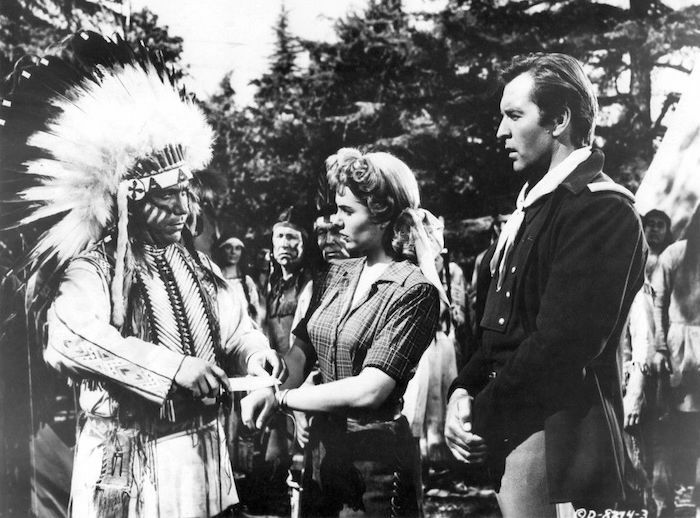 Away from Universal, she was in The Gunfight At Dodge City (1959) with Joe McCrea and Tickle Me (1965) with Elvis Presley. She had a leading man of a different sort when she starred in 1954’s Creature From The Black Lagoon. The Creature would become the last of Universal’s roster of movie monsters, a real icon. Julie in her custom-built one-piece bathing suit became pretty iconic as well. Julie did lots of TV, too. 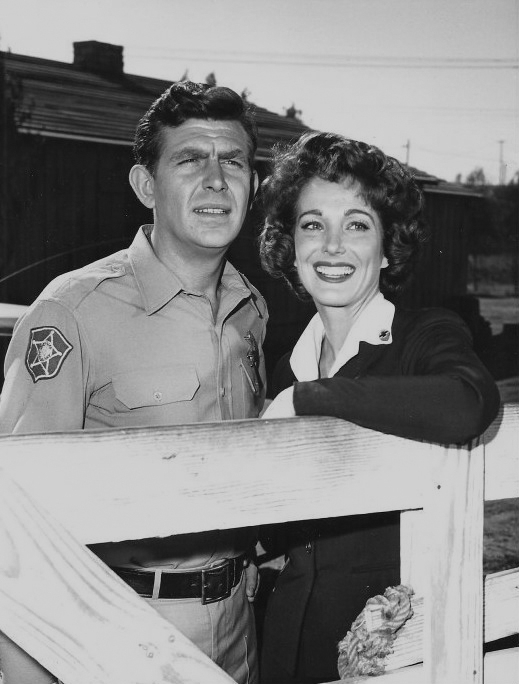 She was a county nurse on The Andy Griffith Show. She was on Perry Mason four times, including the only episode where Mason lost a case. You’ll also find her on The Rifleman, 77 Sunset Strip, Alfred Hitchcock Presents, Maverick, McMillan & Wife, Police Woman, The Streets Of San Francisco and more. 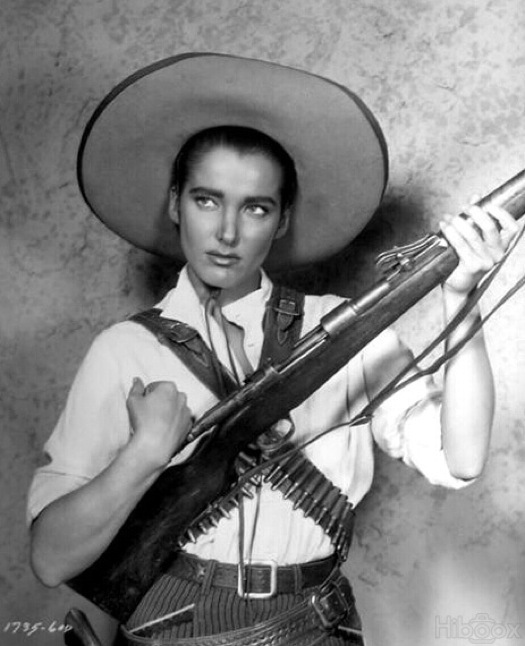 Westerns are often criticized for not having strong roles for women. 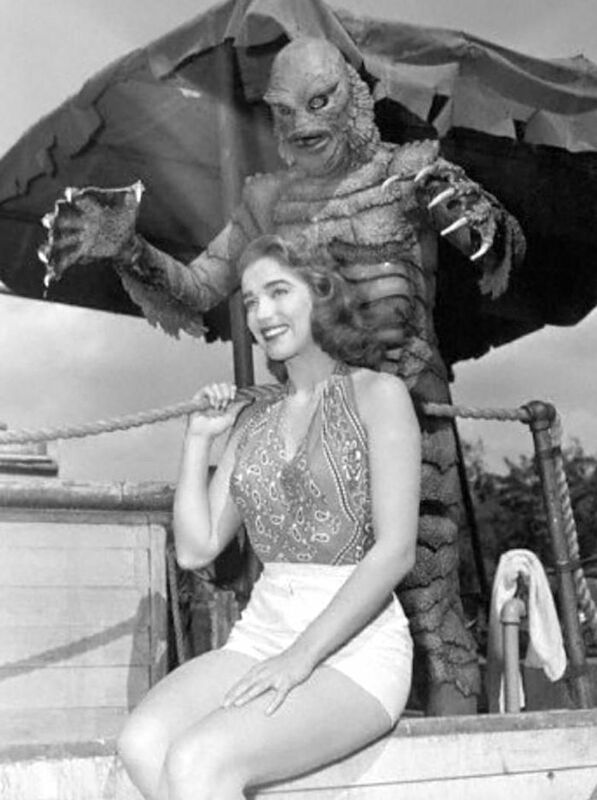 Julie Adams was so good, that never seemed like a problem for her. She always impressed. 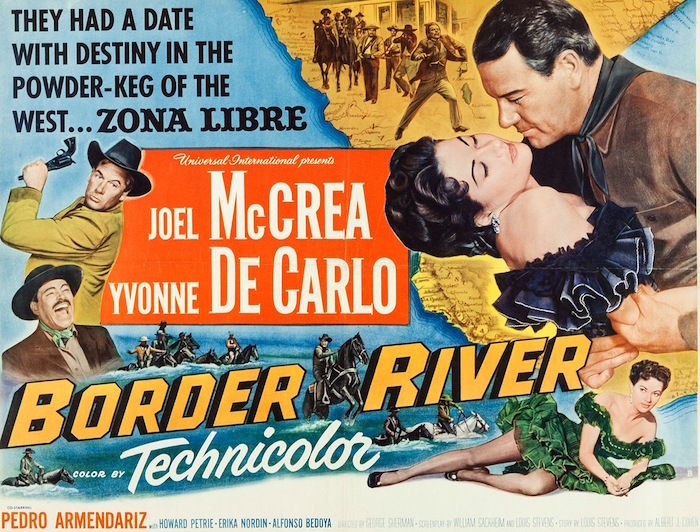 50s Westerns Blu-Ray News #271: Border River (1954). There’s a company in France called ESC Editions, and they’ve started announcing some upcoming Universal Westerns on Blu-Ray. 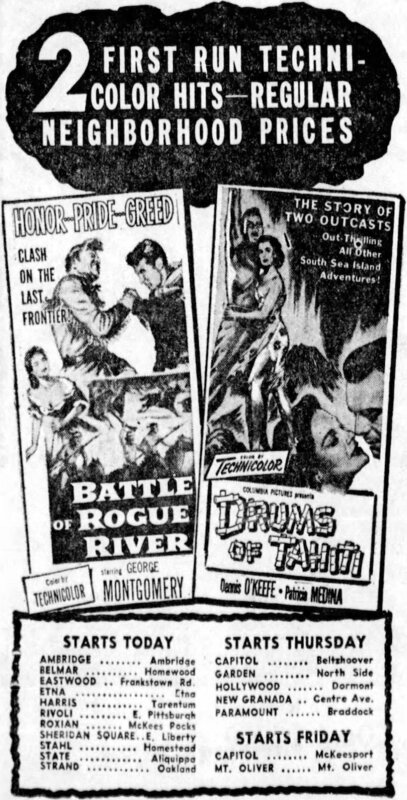 One of those is George Sherman’s Border River (1954), one of the six terrific Westerns Joel McCrea made for Universal. The comments around here have been buzzing about this thing, and for good reason — to have these coming to high-definition is a big deal. I’ll post more information — aspect ratio, region, etc. — as it’s verified. 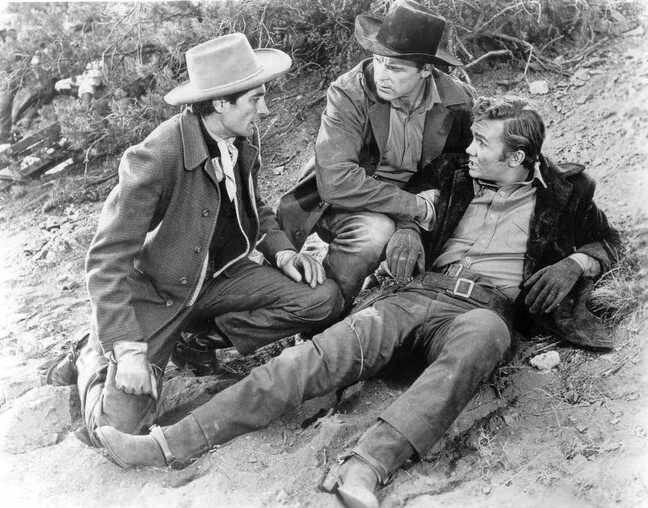 Here’s Ben Cooper as Turkey in Johnny Guitar (1954), with Royal Dano and Scott Brady. 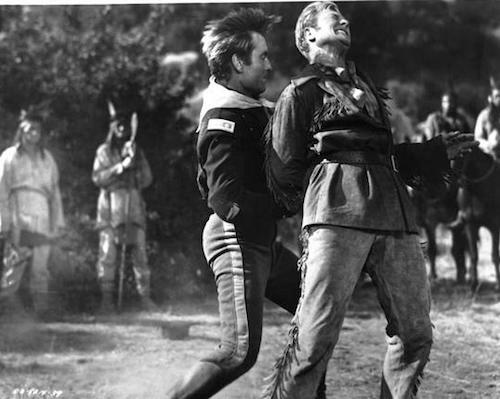 As this demonstrates, it’s hard to find Thanksgiving references in 50s Westerns. 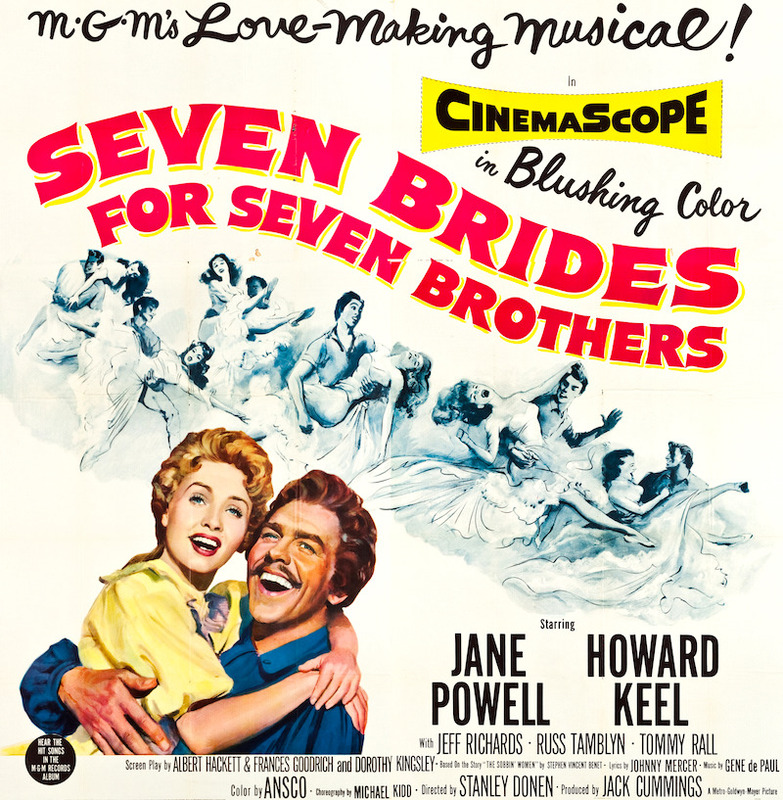 Blu-Ray News #262: Seven Brides For Seven Brothers (1954). I’ve been wondering when this one would show up on Blu-Ray. Well, it’s coming later this year from Warner Archive. I’m not a huge fan of movie musicals, but the ones I like, I really like. This is as good as they get, folks. It was an early CinemaScope picture, in Ansco color (which MGM also used for Escape From Fort Bravo). A flat version was also shot, but according to some, never played theaters (even though it’s been available on video). I’m really looking forward to seeing how this looks on Blu-Ray.